I've been busy this week which is why I have been a little scarce. With Molly moving into Lily's room in the next few months I am gradually preparing. This week we've been going to IKEA and buying bunkbeds and shelving. Molly loves tents. Unfortunately there is no room for an extra tent. As usual I like to try to have my cake and eat it to. So I've been buying material for this (see pic to left). The tent alone costs $200. The bed and the tent costs over $1000. But I think I can recreate this look and make it better in some ways. I'll show you the final look when I'm finished. Wish me luck. This is what we got our son. There are a couple different colors and styles, I got the one with the smaller tent set up, and it was only like 200 bucks for the bed, tent included. Oh, I bet you can :) I'll be excited to see it! This is an awesome bed/fort! I'm sure you can make it even cooler! Can't wait to see the finished product. 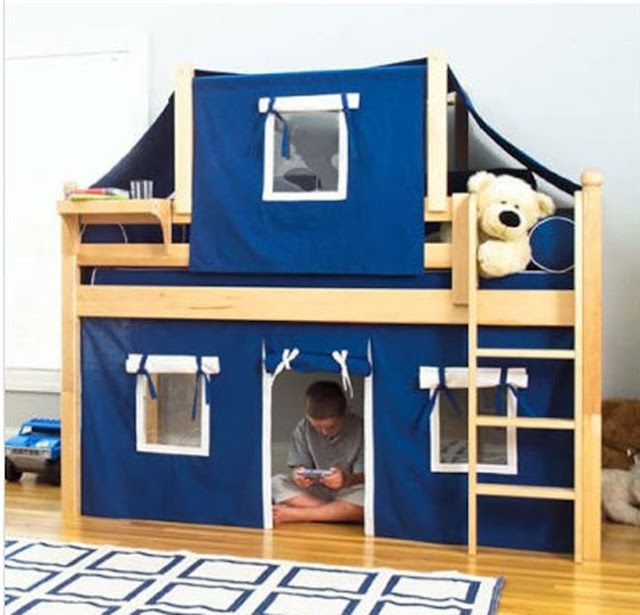 I may have to try one myself when my boys are old enough to do bunks... they share a room. good luck! i love the shelf on the top bunk. would be so fun to surprise the girls with breakfast! i can't wait to see what you come up with! & congrats on the new baby as well. Ooh fun! Our friend has that bed for their toddler and it has a slide on one end. She just hates changing the sheets though! I keep getting an old winners page when I click on the link...am I not looking in the right spot? We'd like to have a second kid one day but only have a 2BR house. I would really love to hear more about your room sharing experiences (including ages of the kids). And I'm super excited with what you come up with for the tent! I saw a cute one on ohdeedoh the other day that was a little playhouse. This is a great idea! I look forward to seeing your finished product. I'm hoping to create one for my little princess too! I watch this blog: http://knockoffwood.blogspot.com/ and she creates patterns for, well, knock offs of the real deal. You might check out her woodworking patterns to make the bed/frame. I'm super excited to see your finished project!! wow I love this, can´t wait to see your version! ok, that is just freakin' awesome! That is so cute! I can't wait to see what you do with it! That is a fab ide - looking forward to seeing your creation. wow, kids love nothing more than a cool tent in their room. love the windows that can roll up or down. Good luck! dude, I want a bed like that for me! how fun! Hey! Did you ever do this?